Alviera, the 1,100-hectare master-planned township of Ayala Land, Inc. (ALI), is pulling all the stops in its inexorable march to complete phase one of its development in Central Luzon. This includes the rise of its industrial park, country club, three Ayala Land residential communities and two academic institutions spread over 207 hectares of the property in Porac, Pampanga. “We’re in the middle of Phase 1 developments which will be undertaken over the next three years at the cost of P7.3 billion,” said John Estacio, Alviera general manager. Ayala Land Incorporated is pouring P75 billion ($1.68 billion)* over a 20-year period to transform Alviera into its first large-scale estate development in the region, done in partnership with Leonio Land Holdings Incorporated. Embankment works have been completed in priority areas, soon to be followed by land development works and utilities. This includes road connection from Alviera to SCTEX. The estate is minutes away from Clark, Angeles and Subic, and is about an hour and a half away from Quezon City via the NLEX-SCTEX. Duplicating the success of its Laguna Technopark in the south, ALI has the Alviera Industrial Park (AIP) to drive economic activity in the region. Sixteen lots of the 31-hectare industrial park have already been sold. Three clusters of standard factory buildings are still available for lease. AIP is seen to complement the industrial hubs in Clark and Subic targeting companies in light to medium enterprises. Avida Land, Alveo Land and Ayala Land Premier are all offering a broad range of residential options for the growing Alviera community. About 1,500 residential units will be ready by the end of phase 1 development. Alveo will launch its phase 1 project in the middle of the year, about 784 units of prime lots with scenic views of the mountain range. Lot cuts will be from 250-542 sqm in size. This new residential community will lie beside Miriam College. Holy Angel University is also set to build a campus in Alviera. 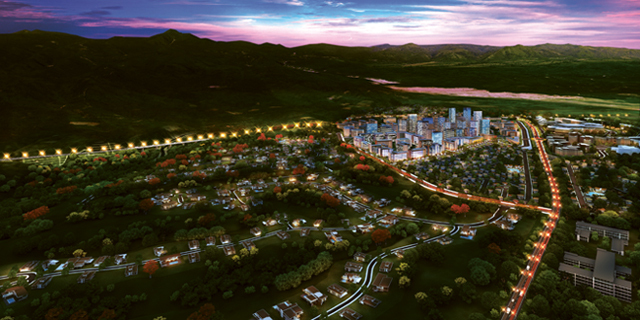 Ayala Land Premier’s project will have the lowest density and the largest lot cuts of 450-1,400 sqm. The community will be launched later this year, and will rise beside the six-hectare Alviera Country Club. Designed by architectural firm Leandro V. Locsin and Partners, the club will be managed by the Ayala Club Management, Inc., which also manages Anvaya Cove and South Links Golf Club. Club shares go for P580,000 for individuals and P950,000 for corporate shares. SandBox at Alviera covers about 2 hectares of outdoor attractions such as the country’s first rollercoaster zipline, a giant swing, an aerial obstacle course, a climbing wall, mini golf course, bike trail and more. It recently opened an outdoor archery range and will soon expand to have an urban karting facility.